Costa Rica – Costa Rica is well known in the eco-traveller’s community as the leaders in eco-tourism. Not only is it one of the most beautiful countries you will ever visit but it boasts a long list of protected national parks. They have also now implemented a brilliant new system whereby it grades lodgings according to their environmental conscientiousness. It truly is a shining beacon in this industry, proving that you do not have to compromise on luxury and beauty to achieve a sustainable relationship with your natural environment. 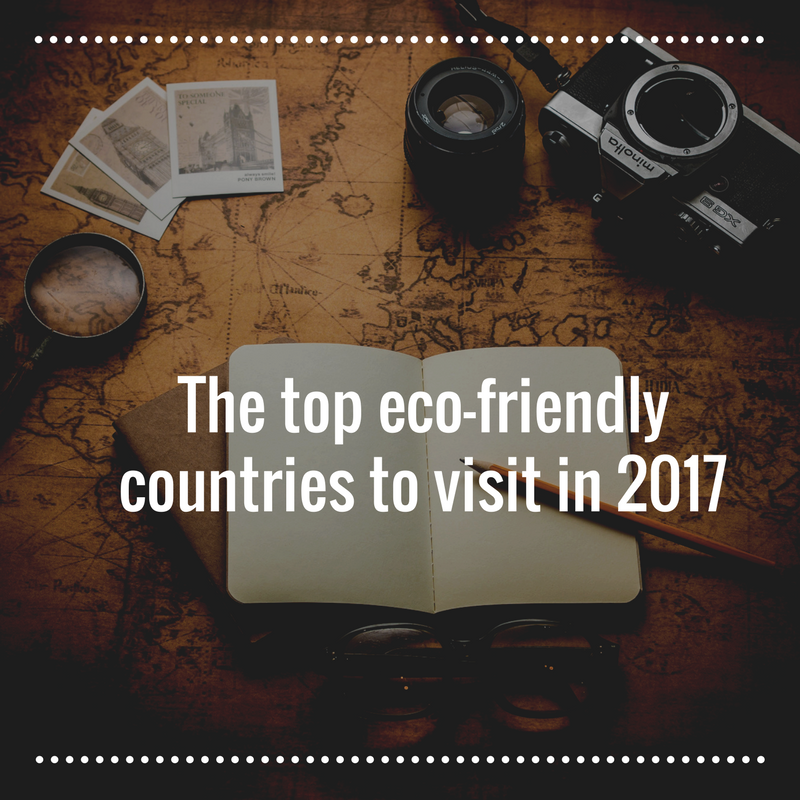 Norway – This might not come as a big surprise but Norway is one the leading countries when it comes to living sustainability. The country might be very small but it is one of the leaders in terms of switching its consumer energy to renewable sources. And if that’s not enough to convince you, I have two more words for you, Norwegian Fjords. Kenya – I’m sure you don’t need me to tell you that there are few countries in the world that could offer you such a rich diversity of the animal kingdom than Kenya (or most African countries for that matter). But far more impressive is Kenya’s unprecedented effort to combat illegal poaching and preserve its natural habitats. Palau – Palau is known for the most spectacular oceans. It’s no secret that our oceans are suffering immensely as a direct result of pollution, global warming and over fishing. The Palau nation has declared most of its reefs no-fishing zones and has been breading a culture of conservation and preservation in the youth with projects, like the Palau Project, that focusses on teaching the youth about these oceans. Galapagos Islands – About 90% of these islands are actually national parks where conservation is key. They also restrict the number of visitors to these islands. You can expect to be treated to breathtakingly beautiful views and world renowned snorkelling sites. Peru – This one is definitely next on my bucket list. This mountainous country is rich in unique fauna and flora that cannot be found anywhere else in the world, about 30% of its plant species are exclusively endemic to Peru. Then there is the rich history, and the vital role it has played throughout the decades in modern day civilisations, known for having archaeological sites containing evidence of one of the world’s oldest civilisations. Iceland – Iceland was recently declared as the cleanest consumer energy country in the world, top that with breath taking scenic views and the infamous northern lights, how can it not be on your list already? Amazon Rainforest – The Amazon is known to provide 20% of the earth’s breathable oxygen. It stretches across several South American countries and is home to literally thousands of micro and macro ecosystems. Make sure that you choose eco-friendly accommodation and activities as it is well known that the Amazon is one of the hardest hit regions by global warming. Lithuania – 22% of this beautiful Baltic country’s energy consumed is generated renewably. It is seen as the pioneer in its region when it comes to embracing and achieving the U.N. sustainable development goals. Naturally, the country boasts a long list national parks that can be visited. With a little research on the best/safest/cheapest mode of transport and the best routes to take most of the touristy towns can be discovered by public transport. This isn’t just applicable to the bigger cities in first world countries. Plus, it’s one of those win-win situations, you’ll be saving a lot of money, AND it’s much better for the environment. In many places the natural habitat can be very stressed and on an extremely delicate equilibrium, especially in water scarce areas. Wandering off the designated pathways and roads set out might seem innocent enough but in some of these areas nature is not able to recover as quickly. In semi-dessert areas, for instance, if you damage the ground covering vegetation it can quickly lead to more serious issues such as erosion. This might seem like an obvious one, but surprisingly enough, this is not a concept instilled in everyone. Throwing your trash in a designated bin makes a bigger impact than you might think. We’re all very quick to comment on the cleanliness of a place so let’s all make the vow to leave a place the way we want to find it. Leaving your trash everywhere goes much further than just being uneasy on the eye. It spreads and soils areas all around and can eventually have serious health risks to both people and wildlife in the area. I’ve heard many horror stories of animals dying a long and slow death indirectly or directly as a result of trash lying around. It’s very easy to be fooled when you’re in a foreign country, where you’re most probably not fluent in the native language or don’t know the area too well. Often, we might visit a popular tourist attractions that is actually doing more harm than good. So-called animal shelters are some of the more common smoke screens. Before you visit an attraction do the homework and make sure what they’re doing is legal, ethical, and most importantly not exploiting anyone or anything. Before you visit the area make sure you are familiar with their customs and cultures. It’s true what they say, knowledge is power, by being prepared you will be less likely to offend someone. For me, respect for other cultures and religions is of the utmost importance. On my recent travels to Turkey I came to realise just how destructive tourism could be to these communities and nature, suddenly I felt so guilty that I too was contributing to it. A large number of tourist attractions around the world are more often than not natural wonders or phenomenon’s. It not only attracts hundreds of thousands of people every year, but is also often the biggest source of revenue for many of the 3rd world or developing countries. Sadly, these people and places are often exploited, partly due to ignorance and partly because they are just so desperate for the income. The internet can also do a lot of [unintentional] harm. The World Wide Web is full of dreamy eyed travel bloggers and agencies telling us just how wanderful the world is out there. To top it all off, traveling has become somewhat of a culture nowadays so there are tons of special offers and tour groups making it so much more affordable for us laymen. Tourism and conservation often goes hand in hand and it’s a great way to raise funds and awareness on critical issues in specific areas, but you need to be very careful which ones you support. Countries usually have very specific laws around wild and captivity. I’ve now, more than once, almost found myself in a situation of supporting an institution with a less than favourable reputation in the industry. Unfortunately, there have been some people now that have seen the income potential from such institutions, and there have even been instances where they kidnap the young from their mothers and raise them in the sanctuaries as so called rescued animals, or even start breeding with once rescued animals. This gives the whole industry a bad name, this is, however, not the norm and we should by no means let it discourage us altogether from supporting such institutions. I myself have been to shows where animals are trained to perform certain acts for entertainment purposes when I was younger. Historically, circus acts coming to town or dolphins playing with little red balls were very popular attractions. However, times change, and I think it is important to ask yourself: Is this natural? These animals will spend the rest of their lives in tiny enclosures, sometimes traveling very long distances and forced to practice the same unnatural routines repeatedly. Wild animals should only stay in captivity if they were rescued and would not be able to survive in the wild if released again. When masses of people interact with wild animals it often stresses them out, not to mention all the foreign germs we bring with us from wherever we come from. Then there is the fact these animals remain wild and we never know when instincts might kick in and people get seriously injured, or worse… Then, it becomes very easy to justify that the animal should be put down, but when do we turn to ourselves and realise where the error in judgment originated from? Children should never be used as amusement or a tourist attraction. If you feel the need to contribute and make a difference, then do a legitimately co-ordinated volunteering program. While there are millions of children that needs our time and money, parading for day visitors will not help them at all, it is demeaning and inhumane. As with anything in life, if you are unsure about a trip you are about to take or an activity you want to take part in, a little research will get you a long way. Read the reviews, compare to other similar trips available, and most important of all trust your instincts, if it’s telling you something is off, it probably is. I am not the same person I was when I left. I met so many new and exciting people, heard so many inspiring and enchanting stories from all over the world and I am intrigued. I want to experience so much more, see so much more. My idea of what my life should be like has completely changed now. How can I go back to my mediocre life of working all the time and not experiencing any of the wonders that life has to offer? I will have to make some serious changes as soon as I get home. I have met some friends that have a lot of the same passions as I do, and I have come to realise that nothing feels quite as good as spending time with people that completely understands you, there is no pretence or apologising for who and what you are. You see, Namibia is our neighbouring country and I know first-hand the devastating effects the drought has had in our region, so to witness the skies opening up like brought absolute bliss and thankfulness over me. Our very energetic and eccentric host Corne covered all the important topics, form NaanKuse history to what to do if you find a snake in your bed ;). I thought I had done my homework, but there were so much I still didn’t realise about the human/animal conflict situation, and I started to realise just how difficult their task is of trying to change the mind set of people that are used to their own way of doing things for so many generations. After induction we were all divided into our groups and we got to do our first activity on the roster. I was very excited when I learned that my first activity involved the cheetah cubs. No words can explain my absolute level of contentment at this point in time. By now almost all the rain clouds have cleared away and we are feeling the full extent of that scorching Namibian sun that I was expecting. So, it turns out the Gods were in my favour and my second activity of the trip also included cheetahs, I was over the moon. But it was not all fun and games and for the rest of the day we had some hard work waiting for us. Needless to say I slept like a baby. The days flew by, and by now I have made so many new friends, I will forever cherish these nights spent chatting around the fire. I finally felt like I belonged somewhere, these were all my kind of people, we came from all over the world and sometimes the language barriers would hinder a very clever joke’s punch line, but for the most part we had so much in common. I honestly feel like I could stay here forever. While I was there I made a point of not looking at my phone too much, not reading about news in my own country, or anywhere else in the world for that matter. And I must say, I don’t think I have every felt so complacent, happy, and peaceful in my whole life. Not only could I be me, 100% me, without making any excuses for my beliefs and perspectives, but it seemed, to me at least, that everyone around me was experiencing the same kind of serenity. Everyone accepted each other. The days flew past and before I knew it, it was just about time for me to leave, to go back to my own reality. It’s funny how, while working with rescued animals, and people of a forgotten culture in a country whose history looks a lot like my own country’s, who’s unemployment number is much higher than ours, I felt so much love, appreciation and respect, not only for one another but for their environment. And I realised right then and there the potential of my own country, if people with so little can achieve so much, we should all be striving for so much more. When I returned from Namibia I had so many mixed feelings and emotions, I felt different somehow, I was the same person, with the same life, and somehow I felt more out of place than ever before. That is partly why it took me so long to write these posts. It’s a scary thing, realising who you are, embracing it, it usually goes hand in hand with a some major changes in your life, changes that might also affect those dear to you. It takes a lot of courage. I have been back barely three months and it already feels like that feeling is slipping away more and more each day, I’m losing myself again in the hustle and bustle of everyday life, work, family, friends, commitments, responsibilities. I am not naïve, I know the reality of it all, but that does not mean I will give up, I must find a way for my true self to shine and prosper, I must free my own soul. It is my duty and responsibility to myself. South Africa is currently experiencing one of the worst droughts in 20 years and it has certainly taken its toll on all ecosystems. One hears stories of animals that have to be culled in order to prevent a crisis of starvation and overgrazing. Even our little lemon tree at home is looking pretty bleak. A lot of our plants have not bloomed yet, and the ones that have’s blossoms are much smaller than usual and don’t last as long. This is affecting all pollinators, and while many people are putting out bird feeders and have bird baths in their gardens, we often forget about the silent heroes, the BEES. It seems that even amongst beekeepers there are some conflicting opinions on what the best practice might be. I have compiled a very short list of five things you could do that might save a whole colony of bees. Put out some water for them, we here is South Africa can definitely testify of the rising global temperatures. Seeing as we are supposed to be in spring but is already experiencing temperatures in the 30°C region, I am assuming we will have another record breaking scorching summer. Bees generally have to work very hard during the summer months to regulate the temperature in the hives. When fresh, clean water is not easily available they might wonder off to the neighbour’s swimming pool, which might be catastrophic for them. Providing a close, clean and fresh water supply will help them cool off the core of the hive without having to fly too far for it. They also use the water to dilute the honey for the newBEES. It is important to know that once you’ve started to put out water for them you’ll have to keep it up, they are creatures of habit and will quickly start to depend on your source of water. Planting drought savvy plants, it’s not too late to start. Bees will need to have nectar sources for much longer seeing as the amount of nectar on the flowers are so much less than usual because of the drought. A lot of succulent species will have flowers until late summer, and are great soldiers in a drought. Certain herb types such as lavender, sage, thyme, and rosemary will all be able to withstand the drought, more than others in any case, plus you get the added bonus of the wonderful aromas filling your garden and fresh herbs on demand. Most wildflowers are naturally drought resistant and makes for a beautiful and colourful garden at the same time. Shade, this might be more relevant to beekeepers than laymen looking out for wild bees. By providing shade for the hive you will help to keep it cooler and they won’t have to work so hard, foragers can focus more of their energy and time on collecting nectar and less on collecting water to cool the hive. On the other hand I would also suggest that you put the water source in shade, thereby decreasing the amount of water that is evaporated by the scorching sun. Harvest less honey, if you are a beekeeper it would be wise to harvest less honey than usual. It might seem that there is enough, or maybe even more than enough, but seeing as we do not know when the drought will end and how much nectar they will be able to collect before winter comes, it might be a good idea to let them store more of the honey. If you have more than one hive you could also keep a brood box frame, to transfer honey between the hives if you see that one might not be producing enough. This last point is somewhat of a controversial one, artificially feeding the bees. Many experts have conflicting opinions on this matter. Personally I have come to realise that in the long run it has more disadvantages than what it’s worth. Having said that, I also feel that in extreme circumstances, where it is a case of the bees literally starving or you feeding them, I would be in favour of it. It is however, a very delicate thing and there are a number of factors to take into account. Firstly, it is imperative that you only use white refined sugar for your mixture, you can make a mixture of water and sugar, a ratio of 1:1 or 1 sugar: 2 water. Remember to put this mixture in a shallow plate or bowl and to put some pebbles or rocks that will stick out above the mixture, to allow the bees to gather the mixture without getting some of it onto their bodies or wings, which will subsequently lead to drowning. I have also read about people putting out a pollen supplement for the bees. Just remember that whether you are putting out water or some form of a feeding station you might attract some unwanted predators in the process. Always keep an eye out for any signs that your bees are being robbed or killed, chances are something is luring the predators. I guess it depends on who’s asking, both solar and wind have their own unique advantages and disadvantages. For me, the key is the reference point and the end goal in mind. Solar energy systems are generally more affordable and straightforward if you are looking to generate power for your own home. Some of the advantages here are that you can start out small and add on panels as you have the finances, the ease of installation of additional solar panels once the main system is up and running makes it perfect for someone that doesn’t necessarily have the capital to make a total switch at once. Aftermarket maintenance is limited as most solar panels have a life span of 20 years. A solar panel system usually consist of the panels itself, which collect the sun’s rays and turn them into electricity, a battery system that stores the incoming DC currents, and an inverter that converts the DC signals into AC power, which is what we would generally receive from the grid. I came across an amazing website, SOLARNATION that explains the whole process in detail. Solar panels are ideal for urban areas where space is limited; panels are installed on rooftops, which means no extra ground space is needed. For a household of two adults and two children it would cost between R70 000 and R100 000 to make a total switch to solar power. Wind energy systems are generally more suited for larger commercial systems, where power is generated for small towns or to supplement the existing grid. These systems work well in a network, were a “wind farm” can be established. This means that a lot of space will have to be available not to mention the massive start-up capital. These systems are generally not used for the generation of personal power, and private people don’t often opt for this option. Having said that, the progress in terms of research and technology for home wind turbines have grown leaps and bounds in the last 5 to 8 years and there are quite a few options on the market for wind turbines that are more suited for use in urban areas, but you would still need about an acre of space if your goal is to switch a 100% to wind power. Kestrel is a renewable energy company that focusses on wind energy systems for urban customers. Other companies that can assist in home wind power systems include The Green Connexion and Ecotech Energy. A reasonable price, for a wind turbine system that generates about 3.5KW/h, is in the area of R85 000. A turbine system with this kind of capacity should be able to produce enough electricity to power between 60 – 100% of your household’s electrical demand; this of course would depend on a number of variables. Maintenance for wind turbines are limited once they are set up and they rarely need servicing at all. So, to put it all into perspective for you and to help you with the decision making process, an average South African household with two adults and two small children uses between 550 and 750KW per month. This figure will vary of course depending on any number of factors such as appliances used, energy saving habits, and the time of year. So if you take into consideration your budget, energy demand and space available you should be able to work out the best option for your situation. As we all know there’s been a rapid increase in the amount of CO2 in the atmosphere as a direct consequence of our way of life, burning fossil fuels for our primary source of electricity. This has had many negative effects on the earth and all environments around us. Trees are a great roll player in the photosynthesis process whereby they turn the CO2 in the air into breathable oxygen for all living creatures, and while the recent drives to plant trees and stop deforestation are great and should be continued, it is should not be our only concern in searching for a solution for the quest to decrease CO2. The ocean absorbs about a quarter of the CO2 we release into the atmosphere every year. The ocean is absorbing about half of the man-made CO2 that is in the air. Carbonic acid is what is formed when CO2 is absorbed in the ocean, thus resulting in Ocean Acidification. The acidification of the ocean has many effects, not only on the ocean species but on a global scale as well. Did you know that the zooplankton in the ocean is responsible for producing most of the earth’s oxygen? Coral reefs are also an integral part of the ocean’s balance, not only do they provide shelter for millions of little creatures but they also provide food for many of them. The increase in the acid levels is significantly reducing the ability of reef-building corals to produce their skeletons. Have you ever heard of Pteropods? Better known as the sea’s butterflies, they are also a major food source for many different species underwater, but most importantly to the North Pacific juvenile salmon. By 2100 these Pteropods will have literally slowly dissolved, if the acidity level keeps rising at the current rate. It is also affecting shelled organisms, and as a result the entire underwater food web. The fact is that there are limited information and research available on this topic, but scientists all agree on one thing, and that is that the changes in the chemistry of the ocean can only lead to catastrophe, and we need to act as fast as possible if we want to prevent it from happening. Globally over a billion people depend directly or indirectly on the ocean for their primary source of subsidence. Do you know that burning 1 ton of coal emits 2.86 tonnes of CO2, it is estimated that in 2011 the U.S alone emitted about 1.87 billion tonnes of CO2. Now is the time to seriously consider renewably energy sources like wind and solar. The prices of renewable energy solutions are currently at an all-time low and it is more affordable now than ever before. It is time that the countries that signed the Paris agreement all stand together and reach realistic ways in which to reach their goals, I believe the answer is in government funded renewable energy plants, instead of building new coal plants, yes a wind or solar energy plant may be more expensive initially, but if the running costs were to be considered, they quickly seem more and more viable. There is no coal to mine, or buy, minimal waste and footprint on its environment. What is your standpoint on coal vs renewable energy? With an ever increasing world population people have to start thinking out of the box for food solutions. One of these great new revolutions is urban farming. Urban farming is exactly that, farming and producing food within the urban community, there are many ways in which it can be done. Urban farming has many advantages, including a reduced carbon footprint due to limited transportation needs, utilising space that would otherwise be wasted, adding to a greener look of cities, as well as contributing to the reversal of the alarming levels of CO2 present in cities. It is also found that it generally uses less soil and water, and very importantly, supplies a pollen source for the city bees. These are often the most popular and prevalent due to its simplicity. Very little initial infrastructure is required and it often also serves as a stress outlet for the people involved in it, a sort of ‘get away’ from the city’s hustle and bustle. Over the weekend I saw a documentary where the shop was growing most of its own fruit and veggies on the rooftop. This means there is practically no transport involved, significantly reducing the carbon footprint of these produce. And because there isn’t nearly as much soil to be watered you save on that as well, not to mention the space efficiency. It uses less than 5% of the water of conventional commercial farming. This method produces both fresh leafy greens and a healthy supply of Tilapia fish. I have seen very successful examples of this in old warehouses, where the fish is kept in tanks, big enough for them to grow sufficiently, with tall frames holding the containers of greens. There is no soil involved and the roots of the greens hang in a channel of water below them, the nutrient rich water from the fish tanks are flushed through these water channels ‘feeding’ the plants, and assisting in the filtration process of the tank’s water. These frames consist of numerous shelves with UV and LED lights that serves as a kind of replacement for the sun, which means that these veggies grow 24/7. Another advantage of this type of farming is that no pesticides are needed since the environment is controlled and no bugs can get into this closed system. I hear you when you ask, ‘but what about the electricity involved to power this system?’ Because both LED and Fluorescent lights are more power efficient when running them long term as opposed to regularly switching them on and off, they use surprisingly little electricity. So much so that it would be totally viable to run this system on a solar or wind powered energy source. This is different from Aquaponics in some key aspects. Firstly there aren’t necessarily Tilapia fish involved, and these are often grown in greenhouses, or outside, where they are fuelled by the sun, and not artificial lighting. However, people often get confused due to the fact that they both include stacking up the greens on tall frames. In vertical farming, these frames often rotate, so as to give each shelf enough time in the sun to grow sufficiently. This system can also very easily be powered by wind of solar energy. This trend is gaining popularity by the day, with more and more people trading in their lush green lawns for a more nutritious veggie garden. I have written a very informative post about this previously, which will also help you to save water in the process. Other examples of urban farms include beekeeping, cattle farming and underground gardens. With more difficult circumstances caused by droughts, global warming, wild fires, and displaced people food security is becoming increasingly difficult to achieve. How do you plan to help relieve the pressure of food security?